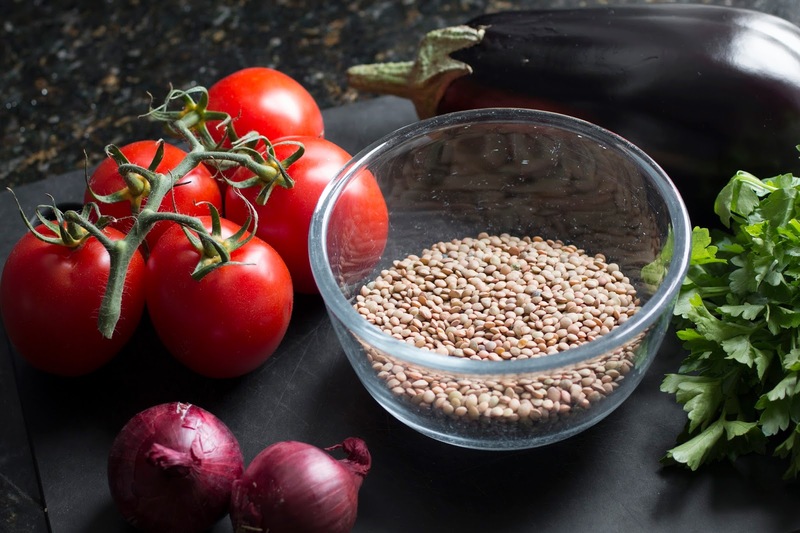 We love lentils so much that the first book of our trilogy on pulses was dedicated to this small and ancient ingredient, with 58 traditional and contemporary recipes from the Mediterranean. Yet, here we are with a new dish, as we keep on exploring different combinations around this easy going pulse. No soaking needed, quick cooking time. Here we use the small brown lentils from Umbria, Italy along with aubergine, ripe vine tomatoes, red onions and plenty of fresh flat-leaf parsley. A truly Mediterranean dish. The secret: we cook each ingredient in a separate and different way, to enhance their single flavour and texture. We braise onion and lentils together. We sauté the aubergine in little oil until soft and sweet, and we season it with oregano. On the other hand, we quickly bake the tomatoes and leave them in the switched off oven for a while. Once cooked, we gently combine all the ingredients together, with plenty of fresh flat-leaf parsley. We serve it warm on its own or pairing with any cheese, meat, fish. 1. Heat one tablespoon of oil in a medium saucepan and soften the onion with a pinch of salt for 5 minutes on low heat, until translucent. 2. Stir in the lentils and sauté for 1 minute. 3. Pour in the water, hot, and leave to simmer for 35 to 40 minutes, covered, until just tender. You do not want mushy lentils. Stir occasionally with a wooden spoon. 4. Adjust the seasoning and add the spice. 6. Arrange the tomatoes over an oven tin, cut-side up. Sprinkle with salt and half of the oregano and drizzle with oil. 7. Bake for exactly 3 minutes. Switch the oven off and leave the tomatoes inside, without opening the door, for 20 minutes. Remove. Leave to cool and chop. 8. In a medium frying pan, heat 1 tablespoon of oil and sauté the aubergine with a pinch of salt for 10 minutes over medium-height heat, stirring frequently. Sprinkle with the remaining oregano. 9. 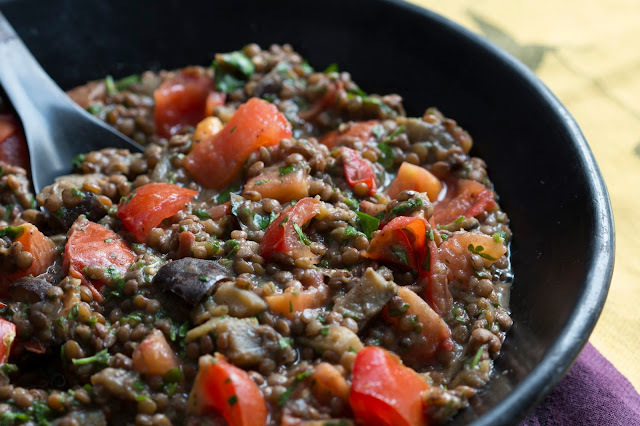 Add the tomatoes and the aubergine to the lentils. Stir in the parsley and drizzle with oil.